If you make a lot of pH measurements, make them colorpHast® pH strips! When you consider that pH is the most frequently made measurement in the analytical laboratory, the importance of making your pH measurements quickly and accurately is clear: it saves you time and trouble. And for a growing number of chemists, the fastest, most accurate way to make pH measurements is with colorpHast® pH strips. Whether you work in the lab or in the field, colorpHast® pH strips meet your testing needs. They come in a wide variety of ranges for different samples and applications. All of them are manufactured by Merck KGaA, Darmstadt, Germany, to ISO 9001 quality standards to provide you with maximum consistency. With colorpHast® pH strips, you're bound to succeed. Covalently bound pH strip indicators won't bleed or dilute. Test 0-14 pH range with a single measurement or try one of our narrow range pH strips that will pinpoint the pH you're trying to measure. Perform pH tests in seconds for just pennies a test. Get accurate measurements in weakly buffered, turbid and even colored samples. Carry pH strips in your pocket for use in the lab or field colorpHast® pH strips give you confidence in your results. With colorpHast® pH strips, you can test the pH of trace samples without worrying about contamination. You can even test weakly buffered, colored or turbid samples and still get accurate results. For samples such as mud and sludge, all you have to do is dip the pH strip, rinse and read the result. The indicators in colorpHast® pH strips give you such sharp, clear color changes, it's easy to make accurate readings. All you have to do is match the color scale on the side of the colorpHast® package to the pH strips. 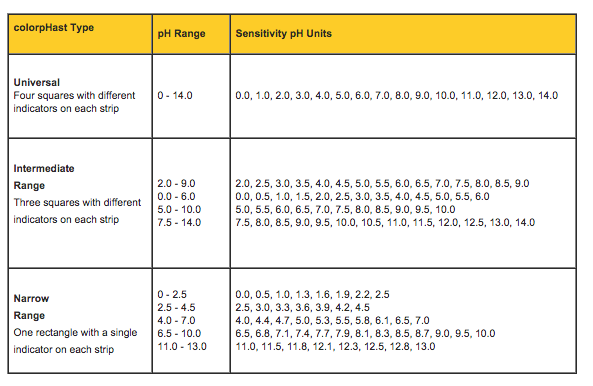 When ordering ph test strips, be sure to select the proper pH range your looking to test from the chart below. Once you decide which range your interested in, be sure to open the pH Range selection box at the top of this page and select the strips you want to order.